Photo above: Sign for the Totem Pole Playhouse just off Lincoln Highway. Sometimes it's the unrecognized gem of a visitor attraction you come across when you least expect it. It pops out of the woods along the roadside as you look for signs of more popular places. And for some reason, you stop. Because of a name. Because it seems different. Because it seems fun. All of those things apply as you trace your way, likely to Gettysburg National Military Park, from Interstate 81 in Chambersburg down Lincoln Highway Route 30 from the west. And there it is. The Totem Pole Playhouse, snuggled in the woods of Caledonia State Park with a summer stock program to regail even the most jaded critic. Photo above: Theater entrance to the playhouse. 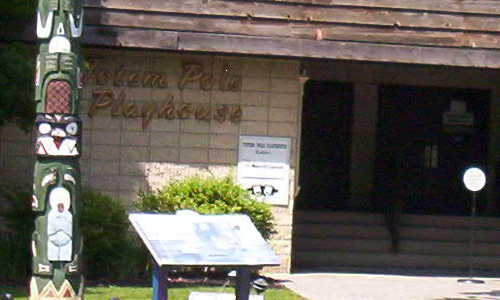 The Totem Pole Playhouse has been playing host to theatre goers since 1951, and each summer puts on a playbill that includes up and coming, as well as famous actors and actresses to its quaint wood building in the pines. This season, 2014, there was Melissa Gilbert, of Little House on the Prairie fame, in Steel Magnolias, the first production of the year as well as Ken Jenkins (Scrubs) and Jill Larson (All My Children) starting on July 18 in The Foreigners. The artistic director of the theatre, in 2014, is Rowan Joseph, of Amazing Race fame and a variety of credits in the film, television, and theatre scene from New York to Los Angeles, and he's made it a point of making the Totem Pole a fun and enjoyable evening, or matinee, in the theatre woods. Photo above: Outside the 350 seat theatre sits this nice respite in the woods at the Totem Pole Playhouse, Caledonia, Pennsylvania. 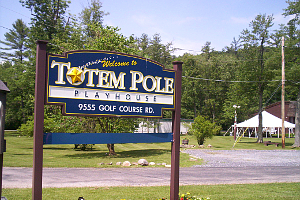 Totem Pole Playhouse is located on Route 30, Lincoln Highway, midway between Gettysburg and Chamberburg, Pennsylvania. Street address is 9555 Golf Course Road, Fayetteville, PA 17222. 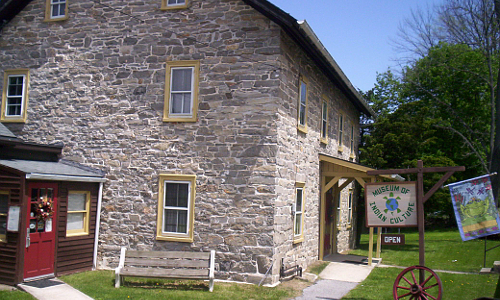 It is also known as Caledonia, Pennsylvania due to the state park. 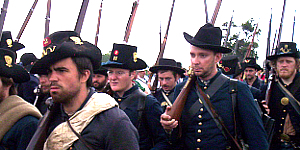 From Gettysburg (Off Route 15) you travel west on Route 30 for twelve miles. From Chambersburg (Off I-81), you travel east on Route 30 for about the same distance. At Caledonia, turn south at the stop light and follow the signs. Historic indoor theater with summer stock performances by famous and upcoming actors and actresses in the woods around Caledonia State Park and Micheaux State Forest. Individual tickets to a show range from $20 (Previews) to Regular Admission of $50. You can buy a season subsciption for$171. There are discounts for children over the age of 5. No children under 5 are allowed into the shows. Open from Memorial Day to Labor Day. There are matinee and evening performances, but not on all days. Gettysburg National Military Park, 14 Miles east. Caledonia State Park, including the remnants of the Caledonia Iron Works and Blacksmith Shop owned by Thaddeus Stevens and burned on the Confederate path to Gettysburg. Across Route 30 from playhouse. Michaux State Forest surrounds Caledonia State Park. The Appalachian Trail winds through the forest and park. 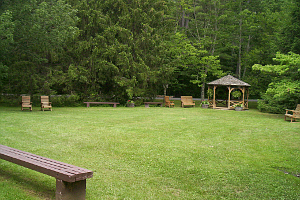 There is free primitive camping in Micheaux and fee campground camping at Caledonia. Big Ed's Elephant Village, between Caledonia and Gettysburg. Photo above: The stockade or small fort that George Washington defended at Fort Necessity. 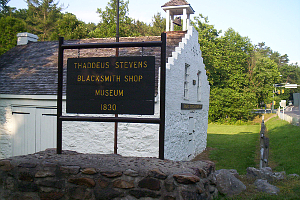 Photo above: Thaddeus Stevens, noted abolitionist, Blacksmith Shop and Museum at his Caledonia Forge, which was burned on the way to Gettysburg by Confederates in 1863. Remnants of the forge remain in Caledonia State Park just across the Lincoln Highway from the Totem Pole Playhouse. Often held outdoors, but not here at Totem Pole, summer stock first emerged at the Peaks Island Pavilion Theater of Bart McCullum in 1887 with local actors. 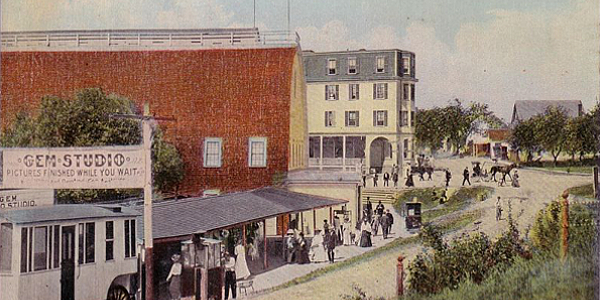 Professionals began performing at that Maine theater in 1888. Other famous summer stock theatres started to pop up around the country. Another early theater began in 1919 at the Muny in St. Louis, Missouri, soon joined during the summer seasons of the next decade at the Manhattan Theatre Colony (Petersborough, New Hampshire), Cape Playhouse (Dennis, Massachusetts), which opened with Basil Rathbone in the lead, and the Berkshire Playhouse (Stockbridge, Massachusetts). Photo above: Postcard of Peaks Island with the Gem Theater (middle structure), which began to be used as the summer stock location in 1898, and the Peaks Island House Hotel in the distance. Courtesy Wikipedia Commons. Some folks refer to summer stock, which is primarily an american invention, as the Straw Hat circuit. Henry Fonda and Bette Davis made their acting debuts in the summer stock theatre program at the Cape Playhouse (photo left courtesy of the Dennis Historical Society). For more information and history on summer stock theatre, you can read Summer Stock, An American Theatrical Phenomenom by Martha Schmoyer LoMonaco. Lil Le Hi Trout Nursery. Trexler Nature Preserve, Lehigh County, PA. Horseshoe Trail, Valley Forge to Harrisburg, PA.
Battle of Kelly's Ford, Rappahannock River, Virginia. Phelps Wildlife Management Area.